Aubrey Thompson talks about ‘My Story’ to the January 2016 breakfast of St Andrews Business Club. 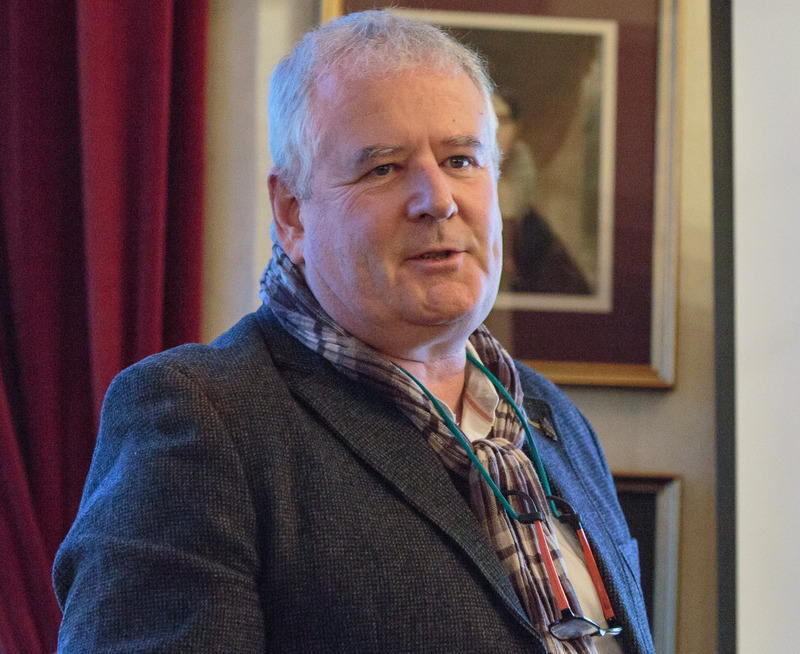 Accomplished serial science and technology entrepreneur Aubrey Thompson was the latest successful business person to share ‘My Story’ with members of St Andrews Business Club at its January breakfast meeting. The dominant theme running through his varied career has been the ability to see the many potential markets for a new technology and the ability to market them effectively in the global marketplace. But his story started in Dublin, where he gained degrees in Applied Physics and Applied Chemistry from Trinity College and the Dublin Institute of Technology. Aubrey also organised a gig for a young man called Paul, better known to us now as Bono, while a student union Entertainments Officer. A brush with one of the stars of The Commitments also taught Aubrey a valuable lesson about cash control! Aubrey’s connection with and love for France and French food began with work there in the early 1980s using solar collection mirror systems and the latent heat in salts. It continued with work alongside his first mentor applying new knowledge about ultrasonography to create the first ultrasound machines. They’re now most commonly used for prenatal scans of babies and livestock, but in 1983 Aubrey spotted the potential for sorting beef by its tenderness in order to identify which cuts best suited sale as premium products. By 1989 he’d spotted the trend for increasing consumption of high-quality beef, but lack of venture capital in Ireland and other factors led him to sell the ‘Tenderometer’ technology to a Danish firm and move into a very different area. Back when the joke was that you bought a (case-size) battery and you got a free ‘mobile’ phone, Aubrey became Director of Marketing for Motorola in France and Belgium and one of the team who led the creation of the marketing and distribution networks for mobile communications – the precursor to today’s retail shops. A move into manufacturing mobile antennas in China led to Aubrey becoming Managing Director of Infocell, the company which developed one of the first wireless real-time passenger information systems and rolled it out to buses and stops around London. And created what may be the first mobile app – a system to tell mobile users when their bus is arriving. After a spell taking that technology worldwide and to the Chinese market, Aubrey came back to his first love – physics, via the application and interpretation of sound waves. But the scanning subjects for St Andrews-based ADUS Ltd (Advanced Underwater Surveys Limited) were shipwrecks and similar subsea objects for which high-resolution 3D interactive subsea surveys were invaluable. ADUS was acquired by DeepOcean in 2013. One of their subjects was the stricken cruise liner, the Costa Concordia. It was also scanned visually from the air by a drone made by one of his latest ventures, Cyberhawk Innovations Ltd. It’s the world leader in aerial inspection and surveying using Remotely Operated Aerial Vehicles (ROAVs) and is exploring the vast potential for the latest iteration of this technology. The market is growing very quickly with an estimated 1m drones sold worldwide in December last alone! 3D Holographic Radar™ surveillance and its many applications is the focus of Aveillant Ltd, a spinout from Cambridge Consultants, which Aubrey has been Chairman of since April 2014. He also had a St Andrews link through his roles as Partner in The St Andrews Entrepreneurial Partnership. Members showed their appreciation in the usual manner for what was both an entertaining and enlightening story.